Who Will Cry When You Die? 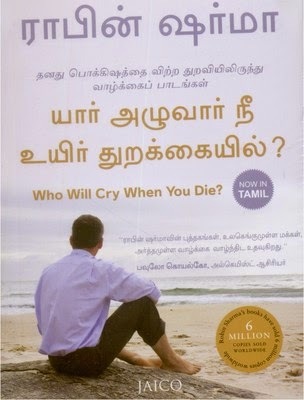 by Robin Sharma is the Tamil translation of the English bestseller by the same name. This book states that humans are so involved with the affairs of their personal lives that they do not attempt to derive the exquisite pleasures that life has to offer. Through this book, the author lists out many answers to all the life’s intricate problems, which could form simple solutions to ward off mental strain and tension that every one encounters. Who Will Cry When You Die? aims to provide valuable solutions to all the readers towards leading a life of happiness, bliss, and comfort. Robin Sharma shot to fame with his bestseller The Monk Who Sold His Ferrari. He is also the author of The Greatness Guide. He has a master’s degree in law and also runs a consultancy firm to motivate employees, which has global firms such as Microsoft, IBM, and Nike as its clients. He was born in the month of January 1965, and presently is a citizen of Canada.